Last Saturday, a Somali Muslim in St. Cloud, Minn. slashed 10 people in a local mall. ISIS claimed him as a "soldier of the Islamic State" and Dahir Adan reportedly asked people whether they were Muslims or Christians before stabbing them. An off-duty police officer shot Adan before more people were injured or anyone was killed. Also on Saturday night, a pressure-cooker bomb allegedly made and planted by Ahmad Khan Rahami blew up in New York's Chelsea neighborhood injuring 31 people. Two police officers were wounded in a shootout Monday as they tried to arrest Rahami. Officials say the casualty count could have been exponentially higher Saturday had all the powerful explosives that officials found in New York and New Jersey detonated. Rahami's journal makes it clear he was influenced by radical Islamists like American-born al-Qaida cleric Anwar al-Awlaki and ISIS spokesman Abu Muhammad al Adnani, among others. 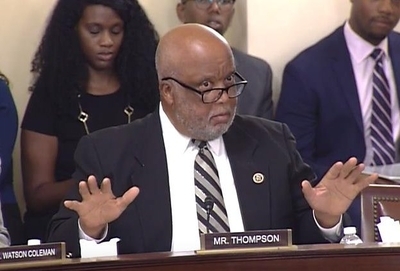 With those attacks still fresh, U.S. Rep. Bennie Thompson, D-Miss., used a House Homeland Security subcommittee Thursday to insist that the government is wrong to make the threat of Islamist terror its top priority. Thompson blasted DHS Office of Community Partnerships Director George Selim for repeating DHS's position that ISIS's ability to radicalize and recruit Americans is "the pre-eminent threat to our homeland security today." It has been proven, irrefutably, that right wing domestic terror is the greater threat, Thompson said, adding he was "disappointed that [Selim] come before this committee ill prepared to answer the questions." After the hearing, committee spokesman Adam Comis told the Investigative Project on Terrorism that Thompson was referring to a 2015 report by the Triangle Center on Terrorism and Homeland Security at Duke University. The center surveyed nearly 400 law enforcement agencies across the country, finding most were more concerned with anti-government extremism by groups like sovereign citizens and militias. That's an opinion survey, not "irrefutable" evidence as Thompson claimed. But the DHS position states a national priority, while the Triangle Center paper primarily quizzed local law enforcement. It's a mistake to assume their challenges and perspectives are the same. It makes sense that a sheriff in Iowa or a police chief in Arizona would worry that their people might encounter someone who somehow believes he is exempt from the law, as sovereigns do. And they often are quick to violence. Thompson's remarks were the most animated, but other Democrats at the Homeland Security committee's Subcommittee on Oversight and Management Efficiency hearing, "Identifying the Enemy: Radical Islamist Terrorism," took aim at the focus on Islamic radicalization. Domestic terror, they argued, merits the greater concern. Advocates of that position used to argue that the data supported them, citing New America Foundation figures showing more Americans since 9/11 died at the hands of domestic extremists like Dylann Roof than by Islamists. That's no longer true, after Omar Mateen's June slaughter of 49 people at Orlando's Pulse nightclub. Mateen paused in his shooting spree to call 911 and pledge allegiance to ISIS. As we've noted, the debate over whether the Islamist or domestic threat is greater – when both are clear and present – is beside the point. Another Dylann Roof out there might tip the scales some day, at least temporarily. The threats are driven by drastically different ideologies, and DHS should focus on ways to combat them. Hearing organizers and witnesses (including IPT Senior Shillman Fellow Pete Hoekstra, whose testimony can be seen here, and written testimony can be read here) say the Obama administration's refusal to speak specifically about radical Islamist terror hinders that effort. The threats also manifest themselves differently. Many incidents of anti-government violence target specific foes or involve a robbery that leads to murder. ISIS, al-Qaida, Boko Haram and other Islamist groups have well organized media campaigns aimed at radicalizing Western Muslims and encouraging them to wage violent jihad. They seek spectacular attacks that create as many victims as possible. When those aren't possible, they encourage random attacks like stabbings and car rammings. Thompson seemed to equate assessments which are driven by dramatically different perspectives, and he tried to shame a national official for espousing the big picture. The congressman is free to have a separate hearing on other threats, but trying to deny the unique challenges posed by Islamist terrorism doesn't seem to serve anyone's interest. And for the same reason. I used to live in his district.